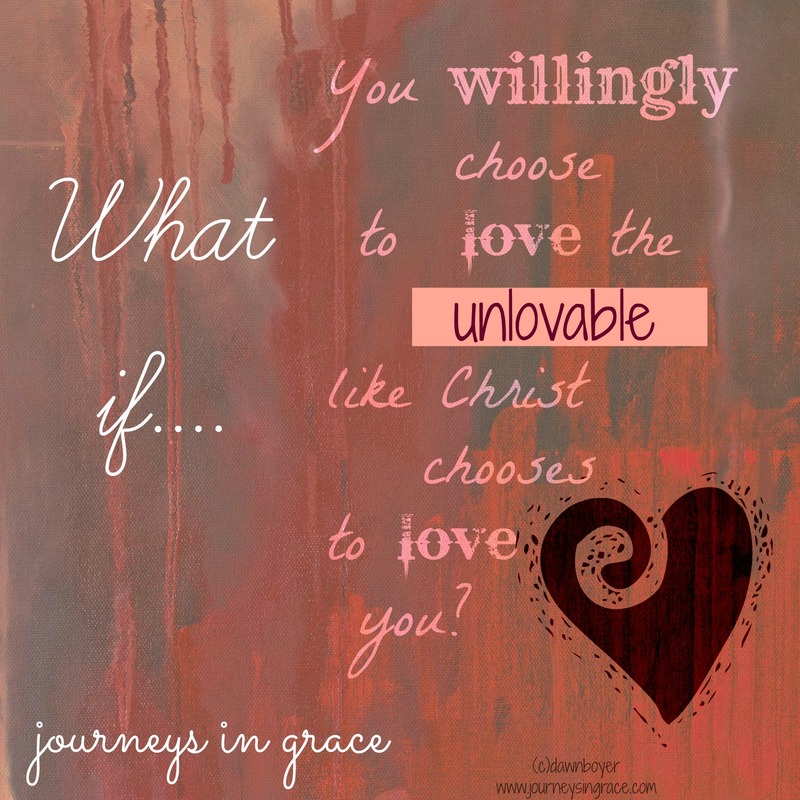 What if … You Willingly Love the Unlovable? Writing for 5 minutes straight today, not editing, no rewriting, no second guessing what is pouring from the heart. I have been thinking about this all day…. The word Willing. What am I willing to do for the Lord? Am I willing to LOVE the UNLOVABLE? Even if they are in my own house? Even if it is me? That is a tall cup to drink, friends. The reality is that many times, I AM the UNLOVABLE one here. Many times it is my failures, my faults, and my selfishness that get right up in the way of all the loving that could be shared and felt here in our home. My mom told me, “It is all up to you, Dawn. If momma ain’t happy, ain’t nobody happy.” That was 18 years ago, when our oldest was just a baby. I was living in the land of ‘no sleep’ and couldn’t find the grace to get through the day without feeling a bit overwhelmed. Flash forward to now, and things haven’t changed much. Well, truthfully, they have. On the outside, I look a bit different. J ( my very shallow attempt at humor there.) And on the inside, I have changed. Thank the Lord. I have grown and drawn closer to him. But, there are still days when I feel exactly as I did when I was starting this journey of motherhood and married living. It is hard to be continually joyful when you live with REAL PEOPLE who need Jesus with every breath they take. Sometimes it isn’t about the grace I extend to others, but the grace I extend to the very ones who are my mission field in this life. Yet, the one word I want to fit there is I am HIS. I am a Child of God who longs to be filled with the LOVE of Christ so that I can share it with those who are needing a touch of grace in their lives. The amount of willingness that is within me to share that grace, the love that has been shed abroad in my heart by His precious Holy Spirit, is directly proportional to the amount of time I am spending in the Presence of God. Today as I read through the Word of God I was drawn to the Words of Christ in Matthew chapters 13-18. I am reading through the New Testament this Lenten Season with a dear friend, keeping each other accountable. I tossed ideas back and forth this week, praying and asking what I should release as a sacrifice unto the Lord. As I waited to hear his Heart, I was prompted to read posts about Lent by other women of grace ( Margaret Feinberg, Jen Ferguson , Jennifer Dukes Lee, Karen Ehman) and how they are sacrificing through this preparation time. As I read The Words of Christ, I realized that over and over each time he healed the sick, broken, and bleeding souls it was first because he was moved with compassion. He was willing to heal because he had a LOVE that surpassed the schedule. Do you realize that He was pulled, prodded, and called upon by so many who were eager to have their most basic needs met? So many came to him. Out of LOVE he moved in compassionate love towards the world’s outcasts who needed a dose of love so desperately. As I read about them, today, I saw myself in each one. Ragged, torn, filled with disease and sin… broken and needing a touch of grace, healing and hope. Yet, reading on, I realized.. He LONGED to give them MORE. He LONGS to give us MORE! It isn’t just the healing of our outer shell that matters most. This outer covering is going to wither and die. But what He longs to fully heal , to complete and make whole, is that deep glorious inner part of your heart, the one that is meant for His habitation; the part of you that will live forever . Are you willing to open your heart to that truth? Are you willing to be overcome by love? So what did He bring me to understand with this Lent journey? It isn’t about what I can give up in the material, at least not what I considered at first. The greatest sacrifice was my need to hold on to those things that were getting in the way of my ability.. MY WILLINGNESS to LOVE, unconditionally. I am willing to give up my need to control. I am willing to give up my need to fix. I am willing to give up the worry and fear. I am willing to embrace His reality. 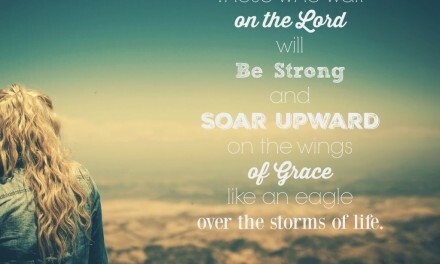 I am willing to hold on to grace. I am willing to LOVE the unlovable. Because dear friends, when I let go of me, when I decrease, that is all the more room for Him to increase in me. What if you were willing to LOVE the unlovable today? Be willing to see the beauty In yourself and in others. Be willing to give up those things that are hindering you from receiving the God’s love and mercy today, and be healed. Be willing to sacrifice so that you can be filled with the LOVE that is always moved by compassion. I encourage you to choose to WILLINGLY LOVE others, just like Christ chooses to love you! Love others out of the abundance of God’s Love. A bit of encouragement from the Word for your journey. Visiting from Thought Provoking Thursday! Have a weekend full of joyand love! Praying you will see the fruit of loving others, Denise, and be encouraged that you have made a difference for the Lord that is exponential! I am so glad you shared today. What about being willing to do the “unlovely” thing? This morning it was cleaning the church bathrooms. Not my favorite task (and thankfully, not my normal task), but it was the task that needed to be done today. As I cleaned, my mind was going through the list of other things that needed to be completed before missionaries arrive. I started asking myself, “What if Jesus needed this bathroom? Would He be pleased by what He saw?” The thought that even this was serving the One I love changed my whole attitude. In serving others, and loving the unlovely (person or task), we show love for Him Who loved us first! Beautiful Jen, my sweet friend. I love the way you grace each moment with devotion and appreciation for Jesus. You are such an inspiration to my heart and I am beyond grateful to call you my friend. Thanks for serving in His light and love. I wandered over here from Jennifer’s place ~ #TellHisStory. Love to read about loving others as Christ loves. Your words resonate and are full of life and meaning! Thank you for pausing in your wandering, Heather. 🙂 Your post on being separate in order to Love others was insightful. I enjoyed visiting your website and am blessed you stopped here. I always think to myself when I am dealing with people who really need love but how do I give it to them. “With God all things are possible” I step back, take a breath, a quick prayer asking advice and remembering all things are possible with him. It took me over 50 years to figure that out. I just wish I had known His love years ago. What a wonderful post and it touched my heart this Sunday morning. Thank you for this blessing today. Thank you Miss Tammy! You know I have spent much of my walk learning about grace and regretting so much of my mistakes. He is teaching me to grab on to each new day and I am so thankful that His mercies are new every morning. Without His love in my heart, my attempt at love is frail and faulty, however, you are so right.. With Him all things are possible. Amen! I am so glad you visited me today. Our changing, rooting out & growing stages are never finished, just ever changing. Loving like Jesus is always going to be difficult, because we don’t have the capacity within us to love to that extent. But thank God for grace! & new mercies every day! Spending time meditating on His word and renewing our mind to His ways and thoughts is when real change happens, pressing into love and out of desires. Walking in Spirit & not Flesh. I love your heart! Blessings! Thank you sweet Forest! I appreciate your kind words. Isn’t this really what Charity, the pure love of Christ is all about? I think you’ve really nailed it with this post. And the more we serve those who at first seem unlovable to us, the more we are able to see them the way that Christ would and the more love we feel for them. Thanks for this post. Absolutely! I love your association of charity and love, Marcy. Without His love there would be no charity to give. Thanks for your note.